Observations of globular clusters teach us how the first generation of stars in our Galaxy formed some 12 to 15 billion years ago and how they have evolved ever since. Globular clusters are extremely dense stellar environments that typically contain between one hundred thousand to one million stars. The density of these star cities presents us with a wealth of information on stars of all sizes but also presents a great challenge – how can we peer into the very heart of such a dense star cluster? Gemini, with its excellent image quality, can provide extremely sharp pictures that deblur and deblend the star images and allow observations right into the very heart of these oldest stellar environments. The optical picture on the left is sharp and clear because of the good atmospheric conditions on Mauna Kea and the excellent optical quality of the Gemini telescope. Yet NGC 6934 contains so many stars that even the thin atmosphere above Mauna Kea blurs the starlight enough that the stars overlap and can no longer be studied individually. 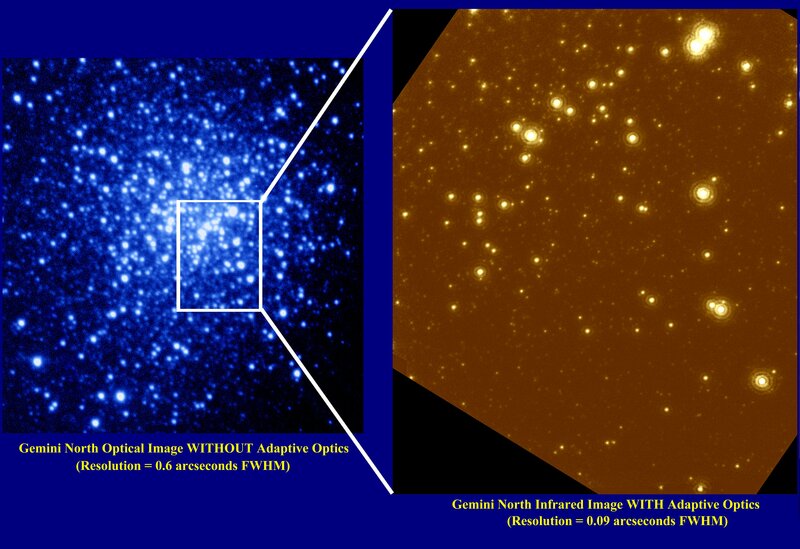 The infrared picture on the right was made with Gemini and the University of Hawaii's Hokupa'a Adaptive Optics System. Hokupa'a, derived from the Hawaiian name for the north star, compensates for the remaining blurring of starlight by the atmosphere above Mauna Kea. The resulting picture is so sharp that individual stars can easily be seen and studied in detail even in the very heart of this globular cluster. The resolution of the image on the right is comparable to resolving the separation between two automobile headlights at 2000 miles! Adaptive Optics systems use deformable mirrors to correct for the effects of atmospheric distortions to starlight, resulting in significantly sharper images. Adaptive Optics will allow Gemini to at times produce sharper images than is possible with the Hubble Space Telescope. The United States National Science Foundation has provided significant financial support to the University of Hawai'i Adaptive Optics Program to obtain these images. These images are of the central region of NGC 6934, a globular cluster located 50,000 light years from Earth. Although this star cluster is very distant, it is still well within our Galaxy, the Milky Way. Instrument: Gemini North Acquisition Camera. The CCD in the Acquisition Camera has 1024 x 1024 pixels. Processing: The images were dark subtracted. No flat-field correction was done. The images were then registered and co-added. Instrument: The observations were obtained with the University of Hawaii Adaptive Optics System (Hokupa'a) with the infrared camera QUIRC. Hokupa'a is a 36-element curvature-sensing AO system. The Insitute for Astronomy, University of Hawaii, Adaptive Optics Group has more information about the AO system. The detector in QUIRC is a Rockwell 1024 x 1024 pixel HgCdTe "HAWAII" array sensitive to 2.5 microns. A description of QUIRC is available from the Insitute for Astronomy. The images were taken as individual exposures with exposure times of 10 seconds or 15 seconds. The limiting magnitude is approximately K=21.3 mag (5sigma detection). Processing: The images were sky-subtracted using sky images obtained before and after the observations. Then the images were registered and co-added. The images were then processed with a filtering method that suppresses the PSF halo characteristics of partially compensated AO images. This consists in a simple, linear filtering of the image in the Fourier space, based on an empirical analysis of the properties of AO compensated images. It does not affect the core of the PSF, the airy rings nor possible PSF artifacts. To first order, the resolution is therefore the same as in the unfiltered images.